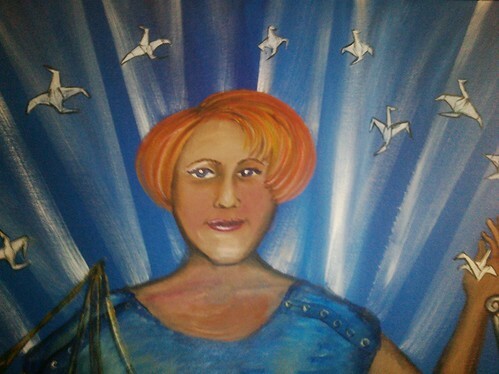 Many of you know me through my work in medical advocacy via writing, speaking or art. But a few of you know me as Reggie, the red haired gal who worked at the toy store Barston’s Child’s Play for 12 years. Every Christmas season since Fred died, I have come back and helped out during the holidays. I slip back into my role in retail sales, with a little comfortable sigh. It feels like slipping into a favorite comfortable shoe. This is the job I have done most my adult life. My current job as a patient advocate can be scary. I fly to places I have never visited to speak to people I have never met. I then pour out my soul using a paintbrush and a voice. I think all those years at Child’s Play prepared me for the work I do today. It is the holiday season and people come into the store with lists of the hottest new toys or with a copy of The Washington Post gift-giving guide in hand. And they ask us “Do you have this or that?” Often our answer is: no. We tried out that toy and it was not good enough to meet our standards. It did not have enough play value or it was poorly designed. I wonder what people would think about a headline that read: “Top 10 Surgeries this Christmas.” I hope they would be aghast. I hope they would not pick a surgery merely based on its popularity. Yet, people often pick toys this way and it makes as much sense. 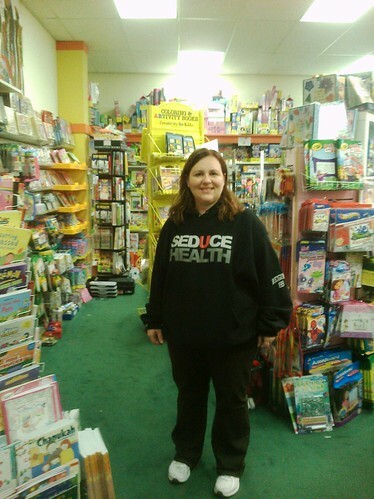 See, Child’s Play is a specialty toy store. We ask you questions, we suggest products based on a child’s interest, age and ability. Amy is my kind of customer, she is asking for a toy that is a good fit for her children. She is as much an informed consumer as she is an informed advocate. Yes, years of working at Child’s Play taught me many things. It taught me how to listen. It taught me how to gather information and prescribe just the right toy. And it taught me how to have hard conversations. Recently, I posted a blog about Engage with Grace, living wills and end of life. That post was cross-posted by Disruptive Women in Medicine. Whilst looking at the cross-post, I read another article by Randi Kahn, Amplify team member, on palliative care, end of life and the barriers that prevent providers from having hard conversations with their patients. In response to the article, I thought of Child’s Play and specifically Steven Aarons and his wife Simmie Kerman who are the store managers. I thought of the many years they modeled how to have such conversations and gave the space and time to allow all of us to address these traumatic moments in a life. A lot of our toys are used by occupational therapists, speech language therapists and child psychologists, many of these professional refer parents to our store. We also get referrals from local private schools and testing services. We often help customers in the moments after they have been given the devastating news that their child has a learning disability, sensory integration dysfunction or autism. We gently show them potential choices that might help with therapeutic play. During these consultations, I have often helped a customer for over an hour even though they only buy a few items. The parent often needs the conversation more than the toy itself. It is hard but it so worth it. It is such an honor to help people at such a point in their life. Sometimes no one has told the parent why he or she was sent to buy such toys. Sometimes we have to have the hard conversation. I will never forget the day I helped the young mother. She came in with a list of toys to help practice for a test to get into a new school. I began to ask her what she meant by practice. She informed me that her child had been tested so he could get into a private grade school. The testing proctor said his scores showed “scatter.” And the child could try again in two years, and meanwhile he could practice. I looked upon the list of toys. It was an amazing sale, if she purchased it all, the sale would total well over $500.00 dollars. My eyes scanned the list again and I began to grow concerned. This wasn’t a prep list for the child of an over-achieving helicopter parent. This was a very specific list. Then I began to ask questions. “When your child was small did he spin wheels?” She nodded her head. “Did he talk early or was it a little later?“ “Later,” she said. I looked down at the list again, took a deep breath and then looked into her eyes. I looked into eyes that seemed frozen in a moment, balanced on a tipping point. Her eyes were brimming with emotion and the tears were held at bay because I had not asked the final question. Then the floodgates flooded opened, and she began to cry. “Oh, I do. I do, “she sobbed. “But no one ever says it. What will we do?” I took her hand and told her I understood. I did not sell a lot of product that day, but that was not important. It was more important to help this lovely woman, and to have the hard conversation that she had been denied. When I began medical advocacy, I began it with the same sense of outrage as Alex Fair before he created FairCareMD. 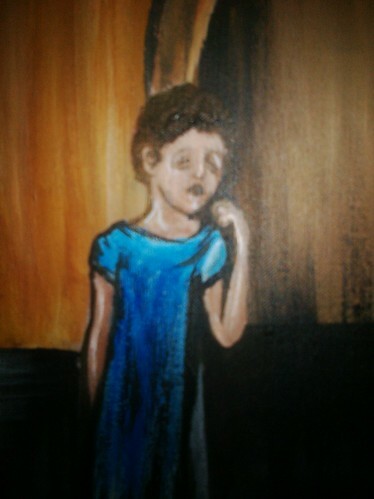 I painted about how Fred was treated because he was treated so poorly. What good business would treat customers so? If you walk into Child’s Play, within moments you are greeted. If you do not immediately ask for help and receive guidance, you will subsequently be asked by every other staff member if you would like help or if you are finding things alright. 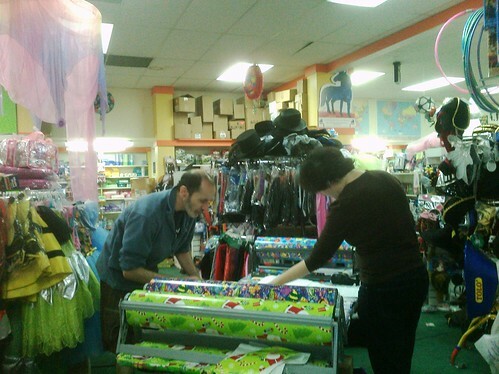 We will guide you through the entire store showing age appropriate choices with honesty and candor. We will wrap your presents at no charge and help you carry your large purchases to your car. Juxtapose 12 years of that kind of service, to our eleven weeks hospitalized. Imagine if you will the nice lady from the toy store waiting at a nursing counter begging for a thermometer for her feverish husband and being denied. Imagine a clerk that had maintained and helped install a point of sale systems begging for access to the electronic medical record. Visualize my surprise at being mistaken for a new staff person by the ambulance transport crew as they picked up my husband from the rehab facility. I had greeted them at the door, guided them to my husband’s room and helped with the body lift. They were so happy I had been “hired.” They had never been greeted before or even made eye contact with the front desk staff, without waiting a considerable time. I am glad I get a chance to work at Child’s Play this Christmas season. It reminds me all the more of that the high bar I have set within the world medicine is attainable. 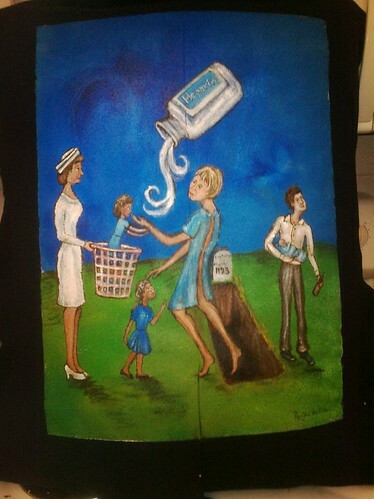 Not long ago Tobias asked to join The Walking Gallery. You might know him from twitter as @tobiasgilk or from his blog: MRI Metal Detector Blog. Tobias is Tobias Gilk, President & MRI Safety Director, Mednovus, Inc. He wanted a jacket focused on MRI safety. And I read quite a bit about the topic before deciding on the image for this jacket. I saw picture after horrific picture of metallic items propelled into an MRI chambers. I read about the very sad story of a six year-old child named Michael Colombini who died in 2001 due to an oxygen canister that flew out of the hands of an anesthesiologist into the MRI chamber. The tank hit Michael’s face and head creating fatal wounds. I thought of painting these things but the horror of the situation seemed too much. I was concerned that viewers would focus on the flying object rather than the systems failure that led to the event. So I decided to focus on our own MRI story for Tobias’s jacket. In the spring of 2009, Fred went week after week to the doctor because of pain. He was prescribed multiple pain medications. 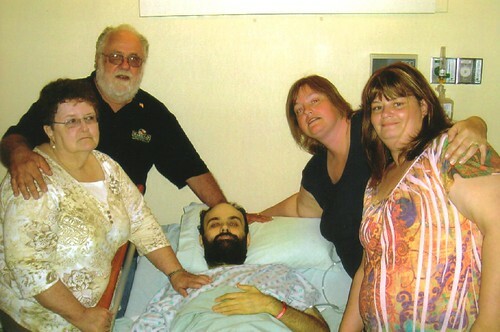 In mid March of 2009, Fred, I and the children went to a local ER to find out exactly why he was suffering unbelievable pain for the past eight weeks. After waiting three hours in chairs a staff person told us that the MRI and CAT scans were overbooked and they would not be able to anything other than X-rays that night. They sent us home with more pain medication and told us to see Fred’s regular doctor during the week. We went to the doctor and she asked if Fred was depressed. I told him of course he was depressed due to extreme pain. Then I demanded an MRI. Fred had been seeing her for eight weeks and she had no clear idea of what was causing his pain. I also asked for a referral to a MRI facility that would see him that week and that the MRI machine should be an open design due to Fred’s extreme claustrophobia. In the small town of Olney Maryland they had such a facility. Fred drove there and had the test done. He said the facility and staff were very nice and helped keep him calm during the experience. They gave him the results on a CD and he gave the CD to his doctor. She called four days later and referred us to an oncologist. Fred never heard from his primary doctor again. The MRI after hospitalization: one of the worst days of our life. I left the consultation went back to Fred’s room and he was missing. The nurses said he had just been wheeled down for an MRI. I found the MRI suite and the tech said I could wait with him until it was time for the test. Fred was very worried. He did not like tight closed spaces and this would be a long MRI experience. I drew my hand across his furrowed brow to soothe his troubled mind. He was hot to the touch. I asked the tech for a thermometer. The MRI tech said they did not have such tools in here. I left Fred’s side and went to the oncology ward and asked if someone could take his temperature, and failing that, could I borrow a thermometer and take his temp myself. The nurses said they were too busy and there were no thermometers to spare. The tech wheeled Fred in and I told her I would be waiting right outside when she needed me. I waited for 15 minutes before the tech came out. She said she would not be able to do the test if Fred did not calm down. I followed her into the room. She told me to take off my ring and watch. I went over to hold Fred’s feet. I began to shout soothing words over the railroad train roar of the MRI. Within moments my Visitor ID tag tore off my blouse and shot across the room toward the MRI chamber. There it was lost. I had no idea how powerful the magnet was and could not grab the tag before it soared out of reach. I worried about it for a moment and then went back to the more pressing task of calming Fred. I yelled my love and endearments to Fred for over an hour. By the end I could barely speak and it was hard to hear as I was not offered ear plugs for the noise. But Fred got through the MRI and I had helped to calm him. After the test, the tech paged a nurse again. Fred was very hot and his temperature was over 101 degrees. The nurse quickly tried to get approval for Tylenol while Fred was wheeled upstairs. Between the fever and the double dose of ativan Fred was altered in his behavior for the next 48 hours. He would not remember that any events or the visits from friends that happened for the next two days. After diagnosis Fred only lived for 84 days. 48 hours lost may not seem like a big deal, but it is if you only have weeks left to live. 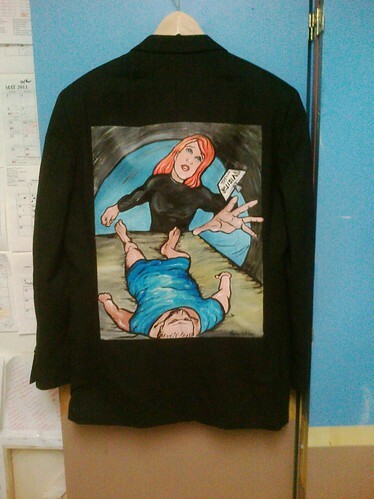 So I painted our experience on a jacket Tobias. A flying visitors pass my not have the visual horror of a crushed bed or a wheel chair imbedded in an MRI chamber, but it represents our personal horror. 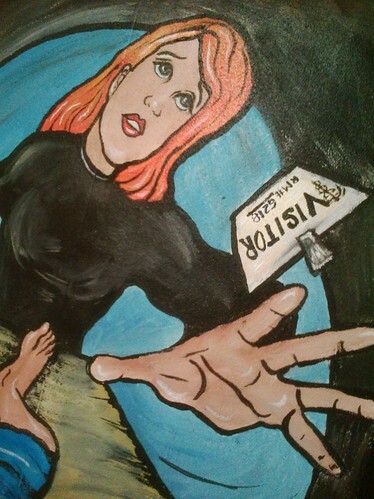 It represents the horror of being relegated to the role of visitor in your own life. Fred did not need two doses of ativan, he needed his wife at his side. And I cannot help but wonder if things would have turned out differently if Michael had his parents with him when he needed more oxygen. I don’t know about you, but I love those promotional items I pick up at conferences. I think it is really cool that my five-year old has a Health 2.0 water bottle and that my 13 year-old has a Cerner backpack. I carry my Disposable Film Festival messenger back on every trip and I wear my Practice Fusion t-shirt all over DC. It gives me little happy chills to wash my brushes in my Microsoft Healthvault water bottle and my favorite re-useable shopping bag is from Kaiser Permanente. I know companies give us these things to remind us of their products as we live our daily life. Perhaps, I love them because I spent 16 years working in retail. I know the careful consideration that businesses take in choosing which items they shall adorn with their logo or message. And I rejoice in the wonderful conversations I have with people about healthcare just because of all the logos and conference detritus in my life. It is sort of like a wearing a sports logo, but you are self-identifying as a fan in a far more obscure genre. My favorite piece of promotional merchandise is my wallet. I have carried it with me everywhere for two years and five months. It is very special. The nice folks at Newman’s Funeral Home in Grantsville, Maryland gave it to me after Fred’s funeral. Did you know Funeral homes had swag? I didn’t know. I didn’t know a lot about the process of dying. It is not something we talk about very much in our daily life. This month is Thanksgiving and I will pull out my wallet and buy all the fixings for a Thanksgiving meal. And I will be standing at checkout thinking of end of life care. I will roll my cart down busy isles whilst considering the wishes of my loved ones. This is very special month for this is the time we congregate with family and have a chance to Engage with Grace. I have written before about the amazing Alex Drane. She founded a company called Eliza. In the summer of 2008, Matthew Holt of Health 2.0 and Alex came up with the idea for Engage with Grace after discussing the fact that most people do not share their end-of life wishes with their family. The Engage with Grace project revolves around the One Slide. This is slide that can be included in a slide set and has five questions about end of life care. 1 On a scale of 1 to 5, where do you fall on this continuum? 2. If there were a choice, would you prefer to die... at home or in a hospital? 3. Could a loved one correctly describe how you'd like to be treated in the case of a terminal illness? 4. Is there someone you trust whom you've appointed to advocate on your behalf when the time is near? 5. Have you completed any of the following: written a living will, appointed a healthcare power of attorney, or completed an advanced directive? I asked Rosemary Gibson, author of The Treatment Trap and an authority on palliative care policy, “How do we prepare to ask such questions?” She told me such questions were part of the reason she wrote her book The Treatment Trap. She encourages readers to ask questions about potential treatment options early in their medical care so they are empowered by this experience to ask the big questions later. So many people when they are diagnosed with a terminal disease find themselves on a scary rollercoaster of treatments not of their choosing. She recommends starting with simple questions to gauge our awareness of self and build toward these harder ones. I know that a life of research and asking questions of doctors helped me to help Fred through his cancer journey. The research I did as a mother led me to question the need for Pitocin in a natural delivery. It led me to question the need for a tonsillectomy if both parents genetically had large tonsils. These simple preparatory questions helped me be brave for the very hard questions to come. I am advocating that you begin to ask questions about your care, that you begin to take ownership of your life and of your death. And why not start this Thanksgiving? Why not start to ask these questions surrounded by love and light and family? Please do not wait to ask these questions as Fred and I did. We filled out Fred’s Advance Directive at the first hospital. We did it all alone. Tears ran down my face as I read question after question to my newly diagnosed husband. We had never even spoke of this in theory; we had never practiced. There was no one to help us. Weeks later before going into hospice, we had to answer the questions again. Again I sat alone with my husband, his eyes as trusting as a child, while I explained the DNR forms that must be signed before transport. I stood steadfast at side supporting his decisions and I was thankful the family united around him with the goal of a good and peaceful death. I did not know at the time that it could be so much worse, that this process can be fraught with more despair and anguish. I did not know it tears some families apart when they fight about their loved ones final wishes. I did not know some wives and husbands disagree with mothers and fathers. I did know that providers could ignore an advance directive if one the immediate family members fight against it. And this is why you need to talk about this on Thanksgiving. You need to talk about this when every family member is there, so everyone is aware of your intent and decision. So every one can support your choice when the time comes. 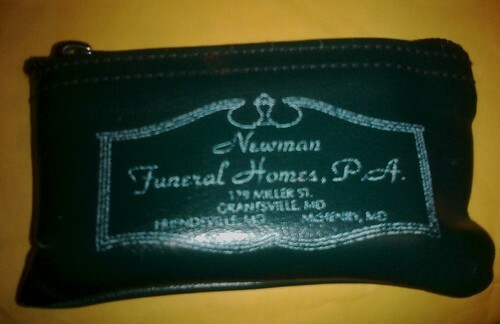 I carry a funeral home wallet because the folks at Newman’s were kind. They greeted my Father-in-law Fred Sr. and I, with soft words and acknowledged our grief and confusion. They did not leave us alone to pick out a casket by ourselves. They helped us fill out paper work and answered every question with dignity and respect. This week Alex Albin was on my mind. 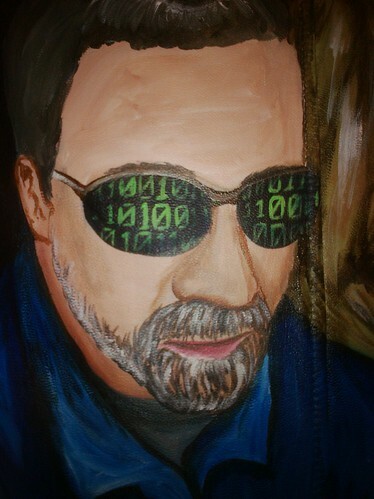 I knew I was rapidly approaching the one hundredth jacket in the Walking Gallery and I wanted that jacket to be Alex’s. Alex had wanted to be part of the Washington, DC Gallery on June 7th, 2011 but she could not. Then Alex planned to attend Health 2.0 in San Francisco in September, but instead she had to fly to Colorado to undergo her 17th Surgery. Alex very much believes in compassionate and informed patient-centered care, as she is very much a patient. So this is Alex or @msaxolotl as I have known her on Twitter. I love her Twitter handle. @msaxolotl. I think it is the name for a dinosaur or some ancient flying reptile that once gracefully soared above us but now is lost in the dust of time. Doesn’t she look happy? I loved her twitter picture at first sight. I marveled at the juxtaposition of soft pliant flesh resting on curvaceous weathered wood. Yes, I loved the picture, but I had no idea how much the old tree and Alex had in common. For Alex has a condition that mimics “dry rot”: avascular necrosis or osteonecrosis. She was diagnosed with MS in 1994 after a bad kidney infection and odd neurological symptoms. She had a paralyzed bladder and would lose her balance. She was treated with steroids. Eventually she began to use a wheel chair to get around and could barely hold a cup in her hand. She spent the next three years trying to regain control of her body and her life and was prescribed beta Interferon at the cost of $1,500.00 per month. Then in 1997, the bone pain started. She saw a Neurologist and an orthopedic surgeon on the same day. The neurologist had some good news; she did not have MS. But her orthopedic surgeon said, “Well, you have this condition in both hips called Osteonecrosis… where the bone dies.” This condition will plague Alex for the rest of her life. To further add insult to injury this disease is most likely a direct result of the blast of steroids. Alex has now completed 17 orthopedic surgeries on hips, knees, shoulder, elbow and wrists in order to save her joints. Due to the honest and frank appraisal of a local doctor, Alex was informed she should see Dr. Steadman in Colorado. She has had most of her surgeries there, but has trekked all over the United States to get appropriate care. Alex is an e-patient: which she defines as engaged, electronic and empowered. She has used every tool in her arsenal to fight this disease. But she is a very special e-patient because she does this for us all. She is a patient who speaks for other patients standing on the firm foundation of her patient experience. I see her frequent tweets and questions posted on the high level threads of thought at the Society for Participatory Medicine. And I am so very thankful that Alex is part of this movement. In this painting lovely Alex sits perched within the branches, a loving smile lights up her face. She is dressed in a red little red cocktail dress, and every eye is drawn toward her face and her body. But how that lovely body suffers, for Alex’s limbs are pinned by the tree. At hip, shoulder and wrist living shafts of wood pierce her flesh and reach for the sky. 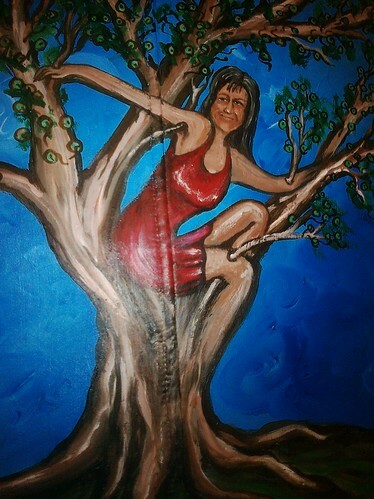 But why is she perched within a sycamore tree? She is so perched because Thursday was a very important day for HIT and consumer engagement in Washington, DC. 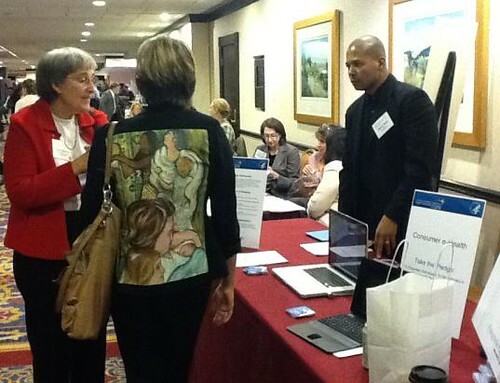 I had received several invitations to register for the ONC meeting available to join by webcast November 17, 2011: ONC Grantee and Stakeholder Summit. I was so thankful that I had the opportunity to attend the meeting in such a way. David Blumenthal began the day with opening remarks. Then at 9:00am Farzad Mostashari, MD, ScM, National Coordinator for Health Information Technology, Office of the National Coordinator for Health Information Technology (ONC), HHS delivered a speech. Farzad was brilliant and I am continually amazed at how his passionate voice has grown since becoming national coordinator. I sat riveted tweeting the speech for the entire 45 minutes. Then at 9:45: nothing. The feed went silent as people gathered for a break. I despaired. If only I could be there in person. Then I glanced up to the top of the web page and saw those magical words: “All Thursday sessions are open to the public.” I changed out of my painting cloths and into conference attire and headed downtown. As I traveled I sang under my breath a song from long ago days of Sunday school. And He said, “Zacchaeus, you come down from there! I sang because I was feeling rather like Zacchaeus, unable to get a clear view and willing to make a spectacle of myself just to be near the amazing people who spoke with such passion about medical records and patient access. And as I sang I thought of Alex far away, unable to attend event after event due to the constraints of a body filled with dying bone. When I arrived at the event, I went straight to registration, I explained I had been watching online and noticed it was open to the public so I had come in person instead. The lovely ONC staffer explained the main ballroom was registered to a point of near capacity. Thus… no non-essential people had been invited. That rang a bit in my ears. Non-essential. I looked around for other patient speakers who were in attendance and did not see them. I saw a lot of venders, providers, governmental employees, and public relations folk from Ketchum, but I did not see a lot of patients. 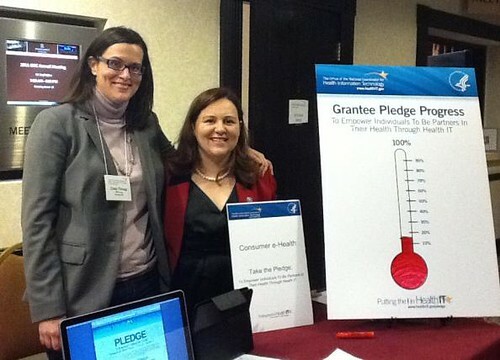 During that time I met a lot of great people and quite a few took the pledge. I saw other Walkers from the Walking Gallery. Ted Eytan, MD from Kaiser was wearing his jacket, as was Lygeia Ricciardi, Senior Policy Advisor for Consumer e-Health, ONC. I also met in person an amazing Twitter voice @BangorBeacon aka Andrea Littlefield. Later in the afternoon someone came over who had taken the pledge and wanted to know next steps. I said the ONC would be contacting people shortly, but there was nothing stopping them from actively applying the oath within their organizations and personal life. I explained I may be just an artist and patient advocate, but I was already living the pledge. 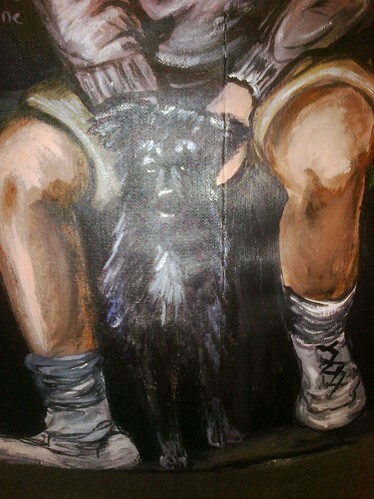 Hence, there is a Sycamore that upholds Alex in this painting. This is the lowly fig Sycamore. The fruit of this tree historically was fed to only pigs and the poor. It wasn’t fit for climbing. But sometimes when you so desperately want to see, desperately want to help, you are willing to suffer extreme discomfort and public ridicule just to view the promise of new tomorrow. And as I spoke to the grantee, I was no longer frustrated by being considered non-essential in the downtown meeting. For the ONC had done so much to include thousands of patients in the online webcast and Twitter stream whilst those patients could sit in the privacy of their homes. They included people who, like Alex, are recovering from surgery so far away. They included people who could not climb trees. I am sad that Alex could not walk with the Gallery in June or in September. I am sad she may not walk in months to come. 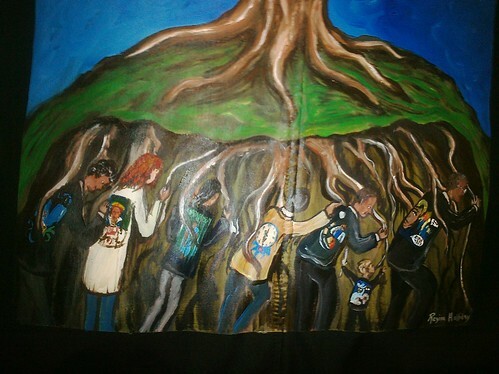 But the Gallery has deep roots, and we shall walk for her. Every time one of the Gallery members walk, they represent us all. What a mighty weight that is. 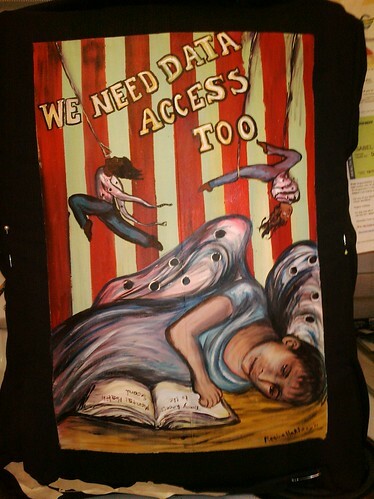 We wear tragedy upon our backs. We may bend and stoop with the weight of sorrow, but we shall bear it together. Do you know what a Sycamore is? It is a Planetree: a tree that Hippocrates sat beneath, the tree that Zacchaeus climbed upon and a symbol of another way of practicing medicine. 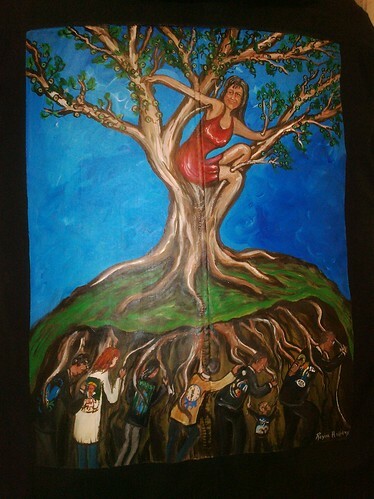 Welcome, Alex on your tree, Welcome to The Walking Gallery. I heard of Zweena over a year ago. (It is a rather novel concept in the world of the PHR: personal health record.) But I recently became more acquainted with its founder and CEO John Phelan. We talked briefly at the Microsoft Connected Health Event in the spring. That was months before the Walking Gallery was a concept let alone a reality. I ran into him again at Health 2.0 San Francisco and he was open and talkative and very excited about patient access to the electronic medical record. I liked that he had no fear of talking to an artist painting in the middle of a crowded room filled with 1,000 HIT enthusiasts. He told me a little about himself and I invited John to join the Gallery. John, like many members of the Gallery, had to do something to change the method of patient care once his life collided with this dysfunctional system. John watched his mother die at the age of 63 from breast cancer. She had put off getting her mammogram and the delay in diagnosis killed her. 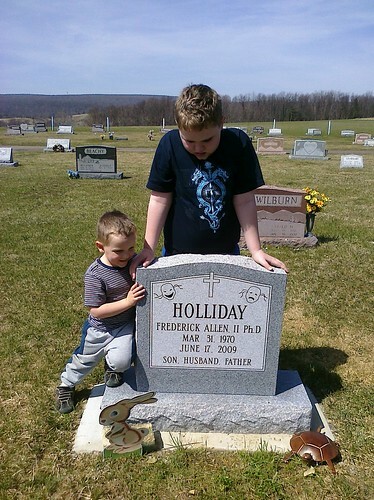 He watched his five year-old son suffer from pneumonia in the ICU for a week. He guided his Father through transfer after transfer in hospital settings. And all along he saw how important it was to have access to the medical record. He founded Zweena out the angst of that frustration. 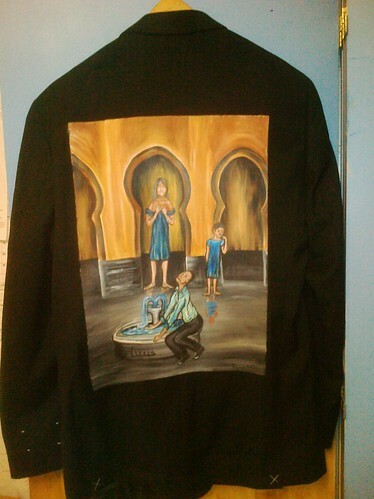 This is John’s Jacket: Midnight in the Courtyard of Zweena. 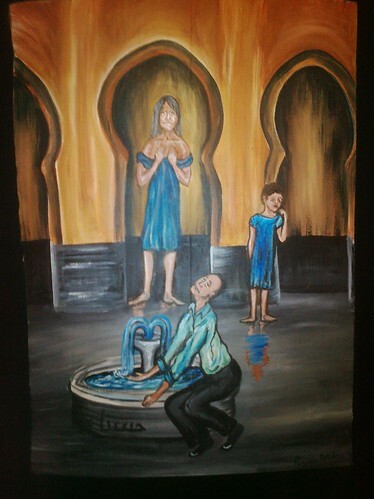 This painting is set within a Moroccan courtyard because John spent two years in Morocco when he was in the Peace Corp. He spent those two years running a home for boys with Polio. 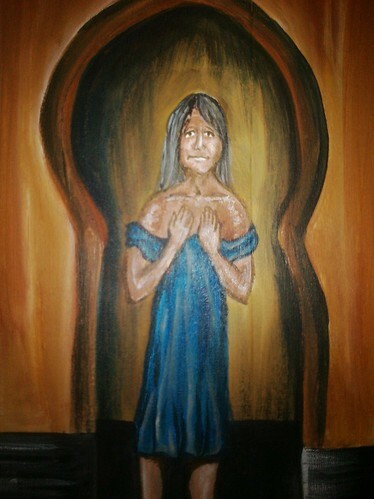 In this painting, a concept of John’s Mother stands in an archway wearing a patient gown with her hands clasped before her breasts. Her face is filled with uncertainty about the path to come. She is placed in a doorway between worlds. Half in shadow half in light, she is preparing for her journey. To her right a small boy stands trying to repress the racking cough of pneumonia. He seems so small and thin. Slightly to the left sits John upon the courtyard fountain. 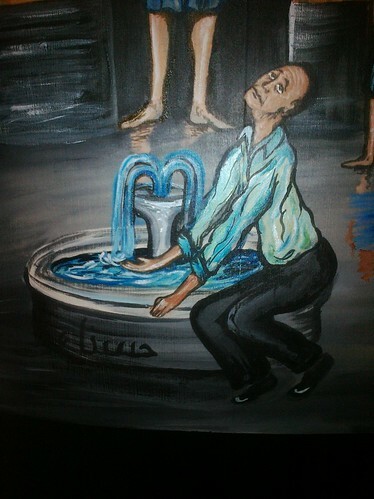 He is trying to scoop up the water/data with his bare hands whilst his mind is fraught with worry. Under the shadowed lip of the fountain one word is written in Arabic: Beautiful = Zweena. If you walk down the outside street, the house that holds this courtyard is plain to the public eye. No one would know about the beautiful garden courtyard within. These courtyards are an important part of Moroccan architecture. This is the space that opens to the public and allows the private family rooms to remain pure without trespass. And that is what Zweena is. It is a PHR that gathers your records for you. It is the space that allows public and private to meet in peaceful understanding and that is beautiful. When I was a very little girl, I had a favorite book. It was called Best Loved Nursery Rhymes and Songs published by Parent’s Magazine in 1973. It is filled with a cacophony of artistic styles and classic, if somewhat terrifying, nursery rhymes. I know this book has affected my style as an artist. 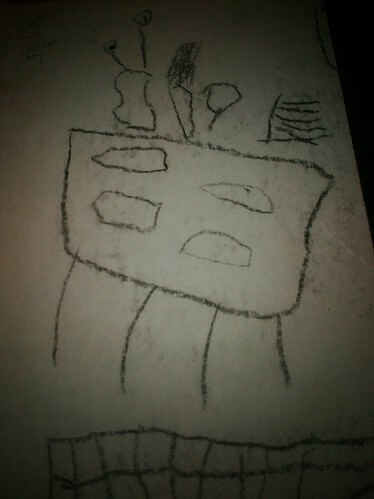 I loved the book so much that I even drew one of my first pictures on the inside cover. 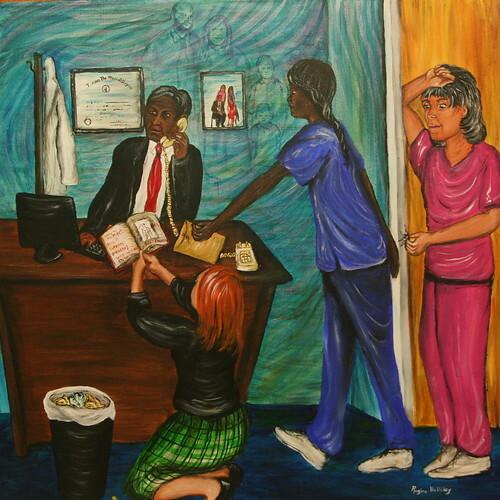 This is “Inside the Beauty Shop” by Regina at four years of age. Yes, I loved this book and it informed me as an artist and as a writer. It also reinforced some primal fears at a very young age, because I am scared of some of these pictures to this day. 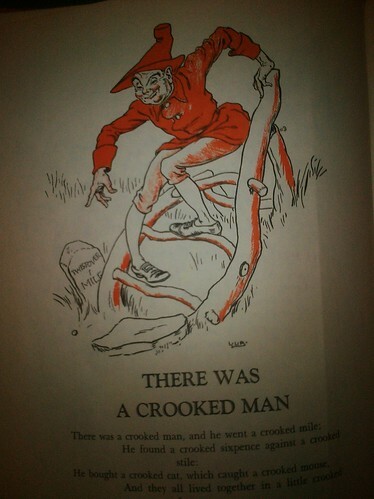 And one of those disturbing pictures is the Crooked Man. I worry for the man. How will he live, how will he walk the crooked mile? And perhaps I should ask Brian. Do you know Brian Ahier? He is a Health IT evangelist. I first knew him as just @ahier on twitter. I began following him on June 1, 2009 sixteen days before Fred died. We commented back and forth on Facebook and twitter, discussing Health Reform, transparency and Meaningful Use throughout the next year. 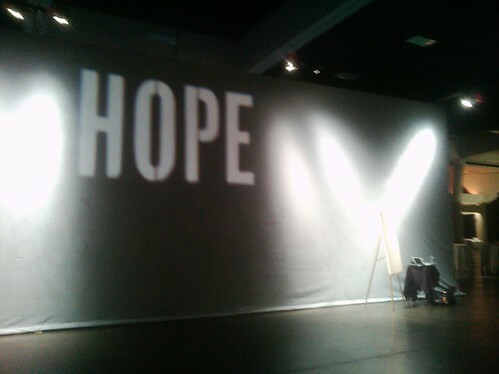 On June 13th 2010, I had the honor to present the patient view on Meaningful Use at the announcement of the final rule. The Department of Health and Human Services posted the entire 53 minutes of the announcement on to its YouTube channel. But Brian was so kind that he parsed out my 5-minute speech and posted it on his account. A few months later on October 18, 2010, I met Brian in person. 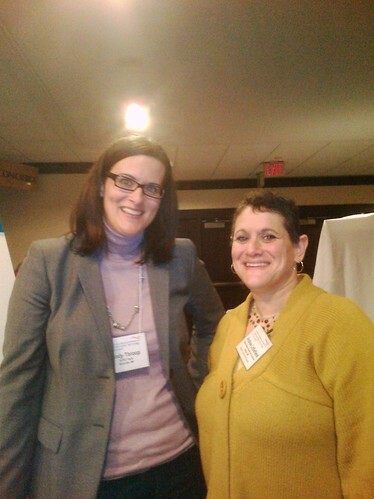 We were both invited by OA systems to give a speech in Chicago on Meaningful Use. He gave an incredibly good speech before the crowd. I especially enjoyed the Q&A session as we bounced the questions back and forth between us. Almost a year later I would see Brian again. This time I would see him on his home turf in Oregon at AIM 2011: Innovating for Healthy Oregonians. Once again he was an amazing speaker. 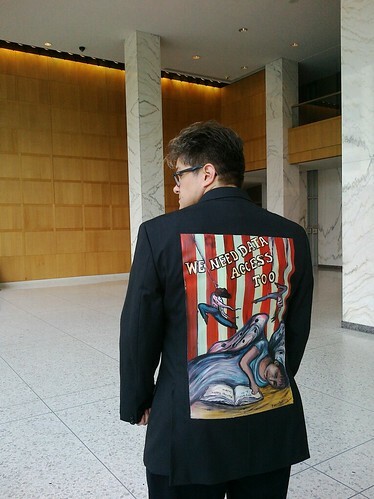 And after his speech we had a chance to talk and he decided to join The Walking Gallery. 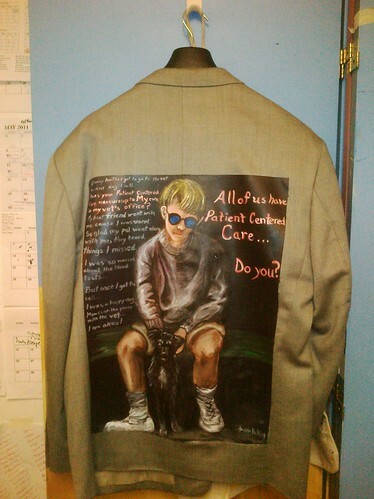 As he handed me his jacket he told me his personal patient story. See, I know Brian the amazing thought leader on HIT. But there is another Brian. There is a Brian who had to watch his mother die at the age of 61. He and his siblings had to watch bungled transitions of care, had to try to parse out the real intent of a living will sparse on detail and had to do that without destroying the heartstrings of a family. 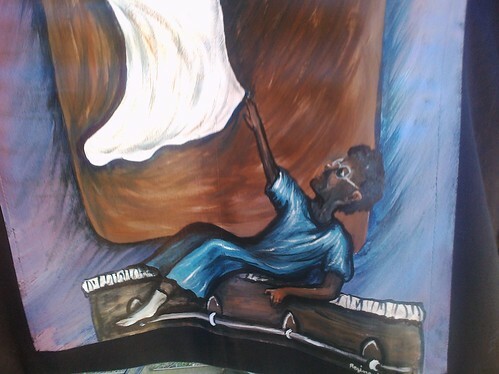 He watched all the problems that could happen within the system medicine be played out on his mother, and 15 years later he is still seeing the same problems. So this is the Brian that has watched his mother suffer and it is also a Brian that suffers too. Brian has Psoriatic arthritis. It manifests with symptoms of painful swollen joints and the sausage-like swelling of fingers and toes. Brian is very fortunate; he has a job that provides health insurance that covers the expensive drugs needed to keep his disease in check. I cannot image a world with Brian’s twitter voice silenced, because of fingers so swollen and painful that he can no longer type. But such a world could happen. Brian shared with me a realization. He met a man, a lovely man, with children. 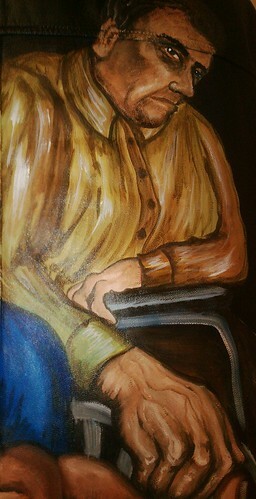 And this crooked man had swollen and twisted fingers and he sat in a wheel chair because of extreme pain. Then Brian found out why. The man had Psoriatic Arthritis just like Brian, but he could not afford the medication Brian took. Brian translates code and arcane legislation into workable language. He reads hundreds of pages about Meaningful Use and reflects that to us in a code we can understand. 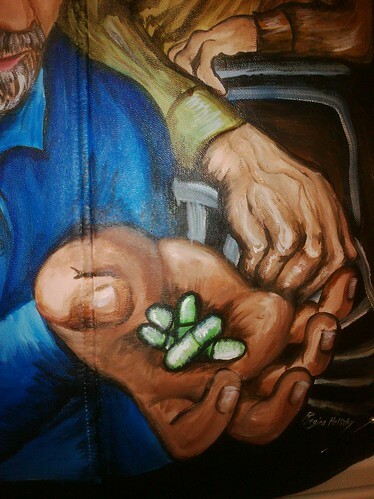 We are blessed that he has this talent, because with it he pays for the medications that make his life livable. Brian has a living wage, and with it, Brian is using the days of his life to better us all. Fred and I were married in 1993. I was 21 and he was 23. We spent less than $1,000 on the event. All the guys in the wedding party wore suits and all the girls wore nice dresses. Our flowers were poinsettias. Fred and I both sold our personal comic book collections to pay for the rings and the invitations. It was a relatively small affair, but very nice with as much pageantry as we could afford. After all, Fred and I had both been theatre majors, so we knew how to put on a show. It was a wedding and not a show. Some folks forget that there are moments in our life that are meant to be sacred. A wedding is such a time, and so is a funeral. These are times we yearn for a sense of the greater good and spectacle exists only to support the sacred moment. 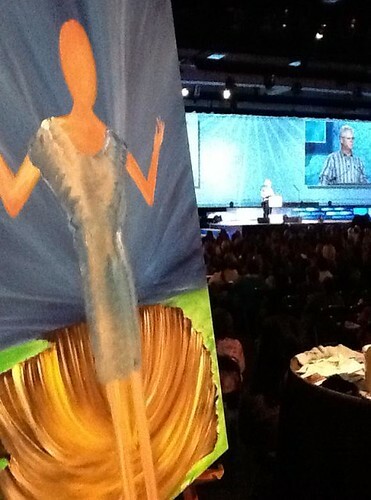 I was reminded of this recently at a magnificent affair called “Greater Good: The 2011 Sharp Experience All Staff Assembly.” It was held on October 11-12, 2011 and approximately 14,000 Sharp Healthcare Staff attended the event. I have been to quite a few events at hospitals and many staff assemblies, but I have never seen an event quite like the one created by Sharp Healthcare. The great hall was set with seating for 5,000. Ushers with flashlights helped everyone to their seats. The Stage had three performance platforms and multiple lighting designs. 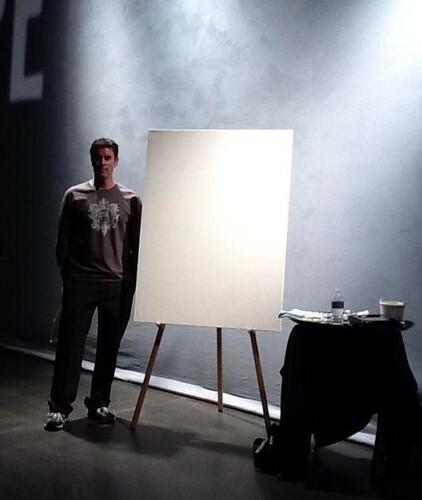 They even erected a small stage for my easel within the audience. The staff of Sharp Healthcare created this amazing experience with Sonia Rhodes, Chief Experience Officer, coordinating this massive event and CEO Mike Murphy acting as Master of Ceremonies. You see, everywhere I looked the show planners and staff were helping and guiding all of those who attended the event. They even bused the staff to the convention center from miles away. On this day the guides were ushers and clean up crew and on the next day they would return to their regular jobs as nurses and medical providers. The attendees were not just the CEO’s, CMIO’s and Board Members, they were also the janitors, technicians and cafeteria staff. Sharp Healthcare invites everyone to the table. Then they show them where their seat is and ask if they can help in any other way. They even assigned me a “handler.” If you are often a speaker, you might have been helped by one these lovely people in your career. They are often a young assistant or intern assigned the task of making sure the speaker has something to drink and shows up at the speaker ready room on time. My handler was a very nice man named Josh McCabe. Josh got me Starbucks coffee and refilled the water for my brushes. Josh is also the lead clinical care nurse in the Sharp Chula Vista ED. 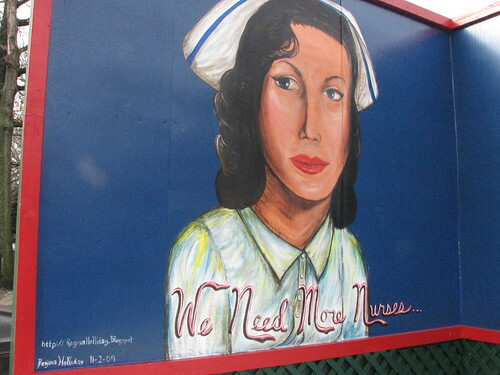 He is one of the best nurses in the Sharp system and he did his part in the Sharp experience by helping an artist perform three speeches and paint three paintings. So three times in two days I spoke before 4,000 attendees of life and love, of Fred and medical records and explained the patient story is a great good thing. 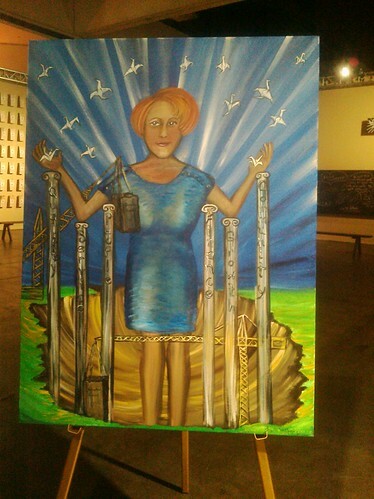 In this painting a patient rises out of an excavation crater, her arms are supported by the six pillars of quality at Sharp. Construction cranes surround her, uplifting her and providing “bags of goodness.” This represents the 14,000 bags that the staff of Sharp filled with gifts and gave to people of the community, be they patients or soldiers. In the air above her, paper cranes fly, rejoicing in her full recovery. The patients and families of Sharp who created hundreds of cranes in support those who are ill inspired this image. 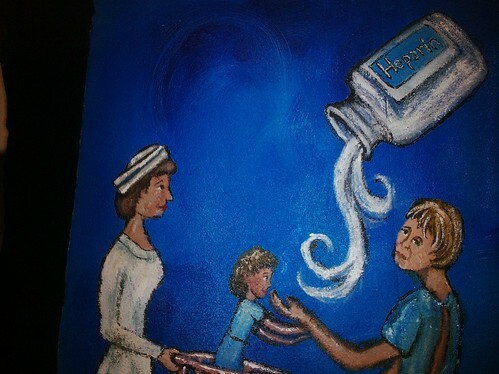 This painting focused on an aspect of care at Sharp Coronado Hospital. Cindy S. Murphy, MPH, Director, Customer Operations Administration at Sharp Healthcare, explained the open records approach that Sharp Coronado has embraced. Using the lessons they have learned from the Planetree model they now involve the patients during shift change hand off and explain the entries in the electronic medical record to the patient. After answering any patient questions they leave a copy of the record with the patient. The patient can amend the record with up to 250 words and that information is logged into the patients EMR. I stood under little paper lanterns at a small reception and listened to Cindy describe a hospital that was actively treating patients with dignity, respect and open access. I wanted to cry for joy, but instead I painted this. 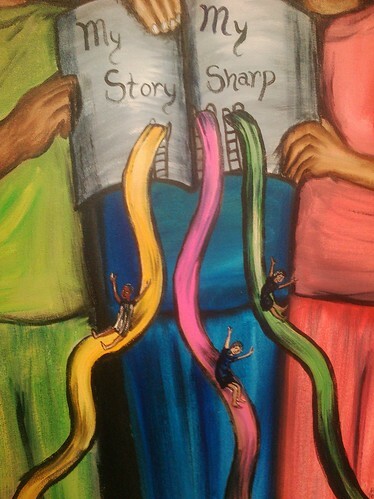 Three members of the Sharp staff open the book that is my story, my record, my Sharp. And from this record patients coast down playground slides in a life-long game of chutes and ladders made all the more joyful by they way they are being treated. 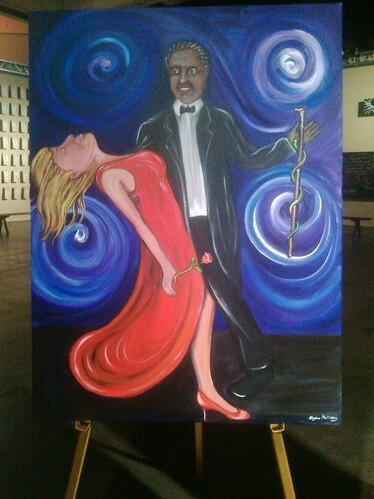 In this painting two sharp staff members perform a low dip as ballroom dancers. It is beautiful and romantic. It is sacred, just like a wedding. 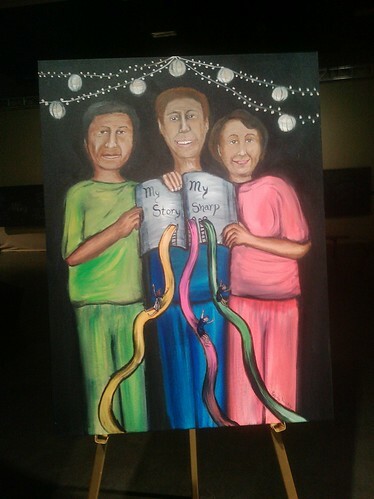 I asked two volunteers to step up so I could paint them dancing. Lisa (Li) deBeaumont, RTT, CMD, and Manager of Radiation Oncology stepped forward as did Dave Libbett. 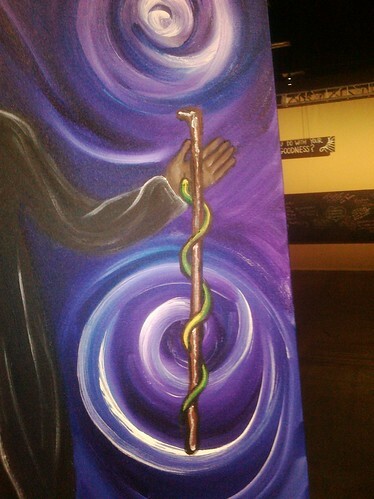 Dave was walking with a cane, so within this painting his cane has become the staff of Asclepius. He is dressed in his finest as he looks with joy upon the viewer. Lisa is wearing ballroom red representing passion and all those who live due to the Sharp Experience. Lisa’s back is arched as she completes her dance and her eyes search the heavens. 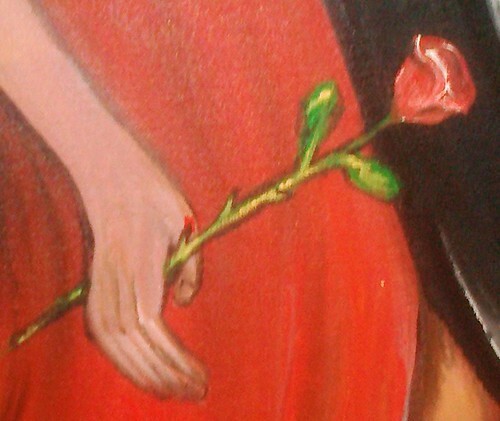 She holds a rose in her lowered hand. And if you look closely you will notice the thorns have pricked her. A drop of blood drips down. She has been pricked because thorns are Sharp. This is what I saw when I visited Sharp Healthcare. I saw people who worked really hard but loved their jobs. I saw people who might walk with pain, but walked with pride. I saw that, sometimes, it is painful to be Sharp but it is so very worth it. And I saw people who love to celebrate the wedding, but focus all their energy on the marriage of patient care and provider work to come. Thank you Sharp Healthcare for that experience, and thank for creating the perfect amount of spectacle to support us in the sacred mission of care. I have spent the last six months explaining a concept called The Walking Gallery. I have asked many people working in health to join this advocacy movement. They have walked in Greece, Australia, Canada, England, Belgium and The United States. Everywhere they walk they are asked about their jackets. Many people wonder how they can become part of the Gallery. A few have asked me how they can “buy” a jacket. Well, I respond they cannot be purchased with money. 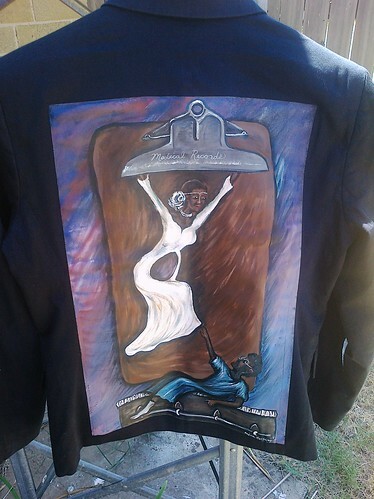 Each Jacket represents stories of personal pain and triumph. They depict a soul laid bare upon one’s back. Members of the Gallery wear their tale with such bravery from conference to conference. 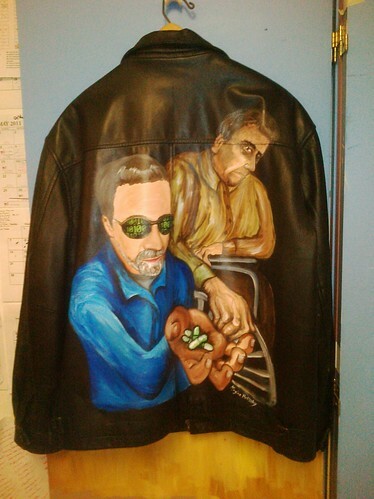 No, you cannot buy a jacket painting, but you most definitely pay for it. This is the tale of Kait B. Roe and her three Jackets. 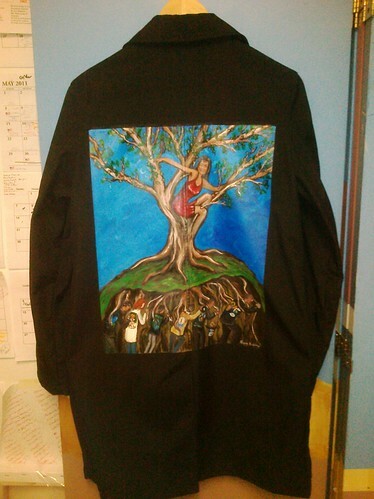 The first jacket I painted for Kait is entitled Ephphatha. I was introduced to Kait through our mutual friend Ted Eytan. She has worked for a number of years in patients’ rights in Maine. We met for coffee at Politics and Prose this summer. It was an amazing conversation because Kait focuses on medical records access just as I do, but her emphasis is on Mental Health records. 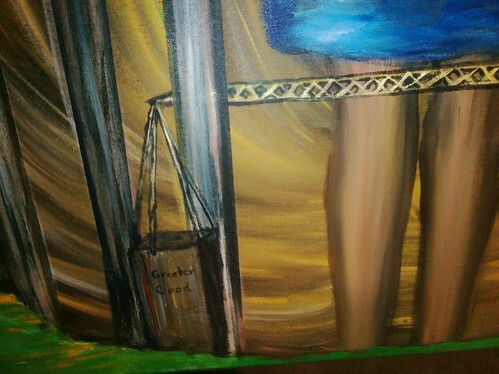 So in this painting, a circus tent rises. The red striped tent walls seem more like prison bars than pretty muslin. 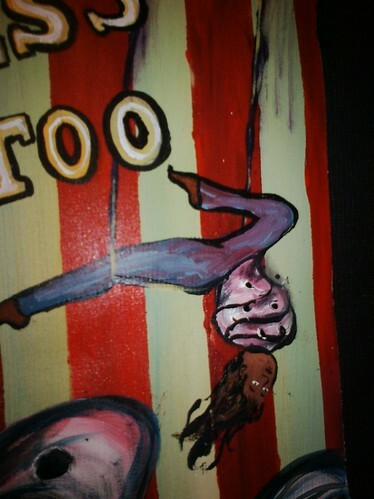 The acrobats on the flying trapeze wear straight jackets. And I fear for these performers, because without their counter-balancing arms they shall surely fall. One performer has fallen and lies upon the floor trying desperately trying to read the medical record. 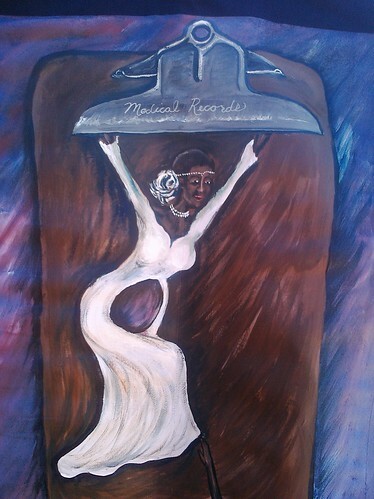 As her eyes begin trace the words of her record, her straightjacket becomes butterfly wings. 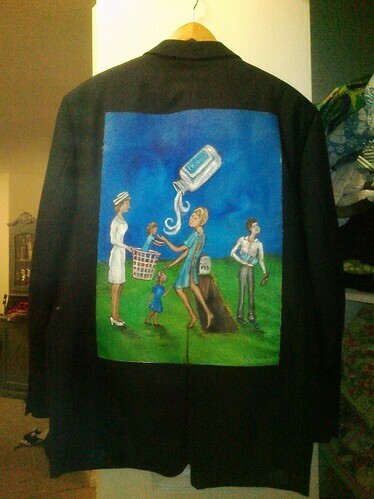 The next time I saw Kait, I painted her another jacket. This painting is called “Good Dog.” It addresses the fact that veterinary care in this nation often is a more patient centered model with better data access. 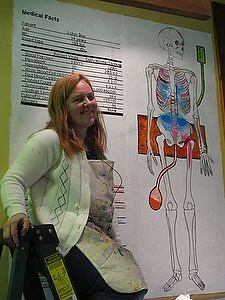 In this painting, a younger Kait holds her beloved pet dog as the text streams by explaining the treatment the pet receives. “My tummy hurts, I get to go to the vet the same day I call. Does your Patient Centered Care measure up to MY care in my vet’s office? My best friend went with me cause I was scared. So glad my pal went along with me, they heard things I missed. I was so worried about the blood tests… But once I got the call… I was a happy dog. Mom is on the phone with the vet… I am okay! Kait will be moving to DC soon to dive deeper into patient advocacy. She will have to leave her current pet dog with his other mother. That dog loves the woods of Maine and would not be happy in our concrete jungle. But Kait will miss him so, I am happy she can carry this dog on her back. Kait is giving up a lot to be a patient advocate. She will give up her dog, her home and her privacy. She will do all of this for others so they will not suffer so. But Kait‘s path toward advocacy began long ago, when Kait lost her mother. In patient advocacy, we all have a tipping point. That point when we can no longer take the outrage and sorrow and we must do something about it. My tipping point was being told access to a medical record would cost 73 cents per page, while my beloved Fred lay dying. But Kait’s tipping point is a laundry basket in a hospital. Kait was only five years old when her mother died. She died as a result of a heparin overdose. Kait’s mother went into the hospital to deliver her little sister. She only lived for 7 weeks after labor she underwent 8 blood transfusions and spent most of that time in an ICU with no visiting hours for children. Toward the end an ICU Nurse hid Kait and her older sister in a laundry basket in the hope that seeing the girls would rekindle her will to live. All I can see in my mind is a little Kait, as sweet and wonderful as my little son Isaac, a little Kait in a laundry basket with all the weight of her mother’s life in her hands. And her mother dies, and Kait loses everything. 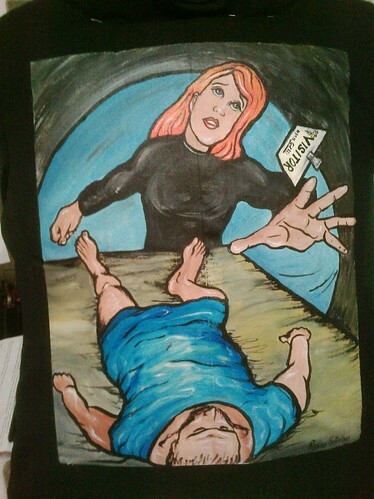 Kait is a rare member of The Walking Gallery. She has three jackets, and their price was very dear.